Here's a quick outfit post from today, snapped between packing up our room in preparation for moving house tomorrow and Saturday. I received this top as an early Christmas present in the mail from Tammy of Button N Thread boutique. Any exciting plans for Christmas? I'm flying back to Adelaide on Saturday night and coming back on the 27th with my sister, who will be staying with us for new years. I don't know about you, but I'm definitely ready to kiss goodbye 2010 and say hello to a new year! Oh and keep an eye out for the Christmas giveaway that will be going up on the weekend. 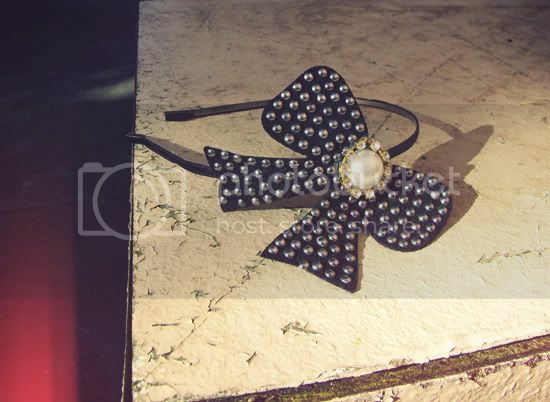 I also received this cute bow headband with the top, both very nicely gift wrapped. 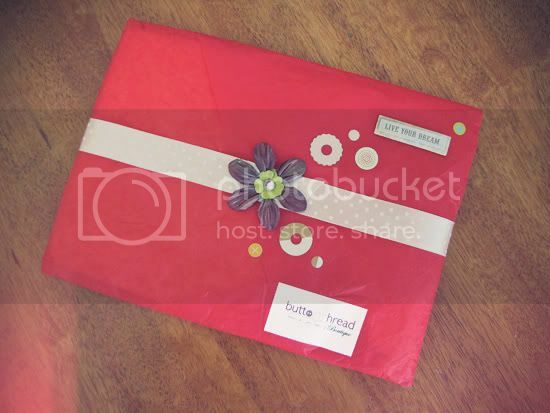 For Christmas Button N Thread are doing free shipping, free gift wrapping and including a surprise gift with every purchase! aw the headband and top is soo gorgeous! I love it and your outfit is fabulous. I had a top just like this about 10 years ago, from Esprit. You've just reminded me how much I liked it... What a lucky girl you are! you look so cute and girly as always. love the neck scarf, perfect. Aww, the top and the headband are so cute! :) Love your outfit! I love the headband. But I love how nicely tied your scarf is! I like how you tied it all together with the scarf (was that a really bad accidental pun?). Sounds like my xmas plans = moving house! the top is so cute! 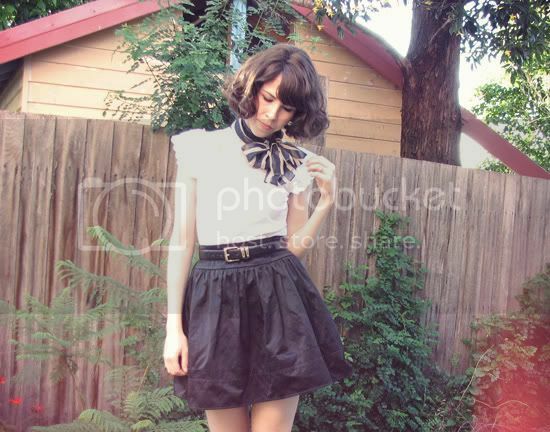 the look is really cute and reminds me of kimbra in the 'settle down' video. 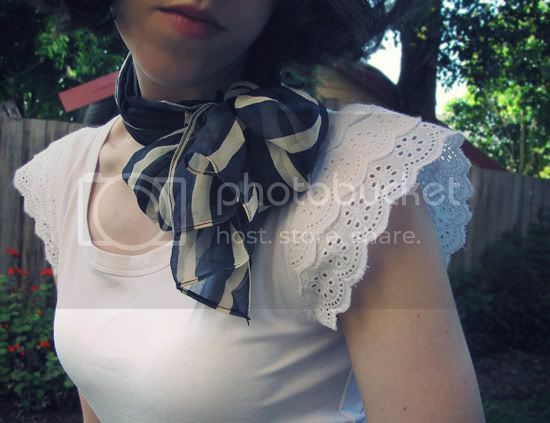 how do you tie your neck scarf like that it looks so cute~! Oh, I love this outfit! The scarf is gorgeous; I love the soft yellow in the cream. Gorgeous outfit Sushi! 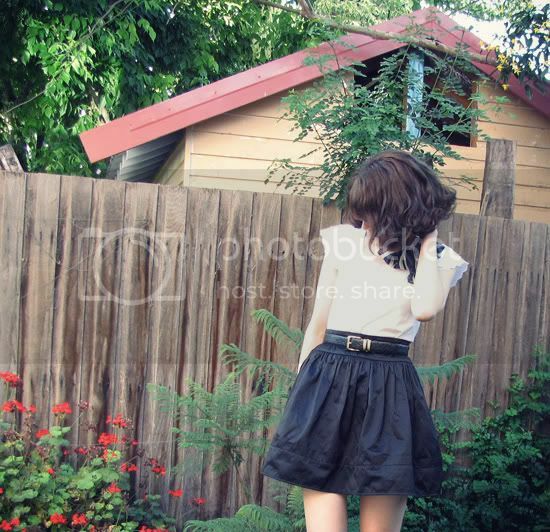 That skirt is adorable! That scarf is the perfect accessory for this outfit. So chic without looking overdone. And I LOVE that headband! I wish we had something on the same scale as Savers in Sydney. I drove past it when I was in melb and it's huuuuuuuge. It's like... every thrift store in Newtown rolled into one. I found a big one in Hamburg too. It was incredible, I could have spent a whole day there. This look is cute, and I like the simplicity of it. I'm definitely a fan of the bow as an accent to your outfit! early christmas presents are the best kind!! Love your outfit, absolutely amazing! wow! great outfit, lovely tops! 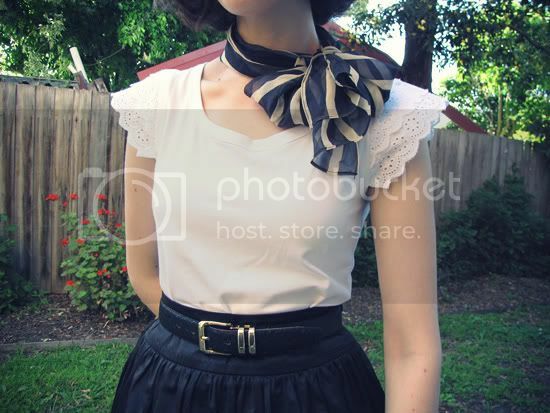 I like this online website, many great stuff..
That scarf gives the outfit the perfect final touch! The skirt is perfect! Love those shapes on you.